When one of the world's oldest and most renowned luxury-automobile manufacturers jumps into the SUV pool, you know there's been a sea change in the way luxury buyers see their future transportation needs. The 2018 Bentley Bentayga luxury SUV is not only the company's first SUV, it sets new standards for luxury off-roaders with a price point to match. When money is no object, the object of your automotive desire should be the 2018 Bentley Bentayga luxury-crossover SUV. Unlike some rivals, this SUV can actually tackle the toughest off-road obstacles and with a top-speed of nearly 190 mph, the Bentayga is also the world's fastest production SUV. Styling is subjective, but we think there are a number of more distinctive luxury SUVs offering the same or better off-road performance for a lot less money. Land Rover offers a number of options, as do Porsche, Mercedes-Benz and Audi. For 2018, the Bentley Bentayga luxury-crossover SUV gains a 7-seat option, new wheel and color choices and a new Breitling clock with a black or white Mother of Pearl face. A new Mulliner trim is added this year. Close your eyes and let us help you slip inside the Bentley Bentayga. Now open them up. You'd never guess you were in an SUV. The British marque's first SUV boasts a cabin easily as lavish as any of its more traditional sedans, coupes and convertibles. Outfitted as either a 4- , 5- or 7-seater, it envelops you in supple leather, available in 15 different hues, as well as four different veneer trims. The Bentayga gets Bentley's newest infotainment system. Options include a rear fridge, a 3-compartment picnic basket in the rear and the $170,000 Breitling Tourbillon self-winding clock. Bentley delivered something of a surprise when it pulled the wraps off its first-ever SUV, the 2018 Bentayga adopting a relatively conventional SUV design, rather than the more swoopy sheet metal many manufacturers are opting for. That approach has been called out by some critics, but to our eye it's fitting for a vehicle that really can handle serious off-road driving. The upright grille, massive air intakes and broad shoulders underscore the power of the Bentayga's 600-horsepower W-12 and the ute's dramatic capabilities. The 2018 Bentley Bentayga SUV blends "sport" and "utility" in a way that actually doesn't make a liar of the famed British coachbuilder. The Bentayga mimics the power and handling of a larger sports car, then marries it with the roomy interior and off-road ability of a rugged off-roader. No small feat, to be sure. With a top speed of 187 mph and a zero-to-60-mph time around four seconds, Bentley's 2018 Bentayga is the world's fastest SUV. When it comes to practicality, the Bentayga offers up plenty of room for people and gear, admirable towing power and, courtesy of its adjustable air suspension, up to 9.2 inches of ground clearance. All this engineering and electronic goodness permits the 5,672-pound Bentley a surprising degree of nimbleness and neutral handling, while delivering the kind of smooth and stable ride one expects from a vehicle of this caliber. The Bentley Bentayga W12 starts with a Manufacturer's Suggested Retail Price (MSRP) of $231,825, with the better-equipped Bentayga W12 First Edition pushing to $300,125 -- both figures including $2,725 in delivery fees. The British maker allows for a wide range of customization, so add features like the $170,000 Breitling Tourbillon clock, the Mulliner Hamper and special paints and you'll nudge $500,000. There's really no direct competition yet. Luxury SUVs currently on the market -- like the Porsche Cayenne, the new Maserati Levante -- play in decidedly lower-priced niches. But look for more direct comparisons in the near future as we see ute offerings coming to market from top-line marques like Lamborghini, Aston Martin and even Rolls-Royce. Do check KBB.com's Fair Purchase Price to see what the Bentayga is going for in your area. The Bentayga comes with a mix of features balancing its on- and off-road capabilities, including all-wheel drive, trailer-sway control, a 4-corner auto-leveling suspension and electronic brake controls that largely cover for its lack of locking differentials. The base infotainment system offers a mobile Wi-Fi hotspot and an impressive, 700-watt, 12-speaker package, though the 1,950-watt Naim system is a must option for audiophiles. There are 14 different leather options to envelop the 16-way-adjustable front bucket seats. From a purist's standpoint, there's the 1,950-watt Naim audio package. For safety and long-distance cruising, the Touring Specification adds active cruise, night vision, lane-keeping assist and other technologies. And for bragging rights, go for the $170,000 self-winding Breitling Tourbillon clock. One way to avoid scuffing your new SUV is to have a spotter guide you through tough off-road situations. However, should you be solo, the Bentayga's front-facing camera provides a bumper-level view complete with guidelines. Tailgating never had it so good. Then again, when you pay $32,000 for the 2018 Bentley Bentayga's 3-box cargo-bay hamper, you should expect a little more. The slide-out system includes a small refrigerator, dry storage for nonperishables and a third drawer for silverware, fine crystal and china. When nearly three tons of SUV can go from a dead stop to 60 mph in four seconds, everybody notices and most people smile. The new Bentley Bentayga sprints that good, launched by its 600-horsepower twin-turbo W-12 engine matched to an 8-speed automatic transmission. Fuel economy takes a hit, but you're certainly not paying six figures to scrimp on performance. When one of the world's oldest and most renowned luxury-automobile manufacturers jumps into the SUV pool, you know there's been a sea change in the way luxury buyers see their future transportation needs. So exists the case for the 2018 Bentley Bentayga luxury SUV, a vehicle that not only sets new standards for luxury off-roaders, but a new price point as well. To separate itself from other luxury SUVs, the Bentayga places an emphasis on outrageous power, over-the-top luxury and an array of interior and exterior colors not seen in a showroom since the 1970s. Although the Bentayga holds this space to itself for now, equally elegant competitors from Maserati, Aston Martin and Rolls-Royce are on their way. 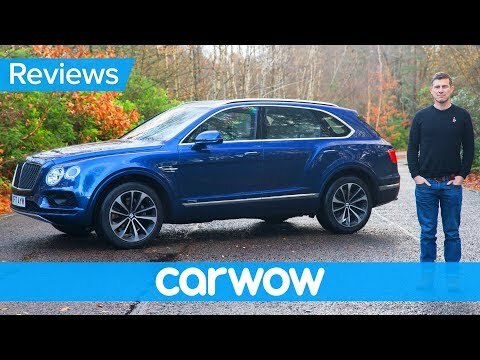 Is The Bentley Bentayga The ULTIMATE SUV For $259,000? Can do what most vehicles. I have no vehicle problems. It works just fine the features are being able to volume up the car new speakers and stereos. 4 door color is silver has navigation built into it already. Can fit more than 5 people cruise controls. Back up lighting camera is pretty good. Seatbelt safety is not an issue. I like how the car is made. It a good car to be use no problem with the car good miles good tires and more to it and good radio service and good seat to the car I love the color of the car the engine is good to go the mirror is very good and the taillight is very bright and the car start right up without no problem. Be careful, it may not be the best in brakes or safety. It is an average car but it is amazing for Its price. I definitely recommend if you are going for something cheap and very good for stability.